When Raf Simons and his right hand man Pieter Mulier rebranded Calvin Klein Collection—the runway division of the American brand—when they arrived last August to Calvin Klein 205W39NYC. It is a more appropriate title and captures the American spirit the chief creative officer and creative director, respectively, strive to instil. They repositioned the brand’s high fashion presence at New York Fashion Week, making it the show to attend, not just another one… Their Spring 2018 show returned to the same Sterling Ruby-decorated space at the company’s headquarters, where they staged their debut. It is imperative to contemplate the first advertising campaign, photographed by frequent collaborator Willy Vanderperre, is captured on the highway in the desert plains of California. Models wear the most prominent looks from the collection—androgynous workwear, the American flag dress, the steel-capped cowboy boots, the plastic-sheathed fur coat. Roadside billboards feature last season’s promotional campaign. It effectively portrays modern America—something Simons and Mulier endeavour to convey in their runway collections. Americana dominates Simons’ menswear oeuvre. He is fascinated by the work of artist Cindy Sherman, filmmaker David Lynch and regularly references American horror films. (Horror is a repetitive motif.) Last season he examined the cultural polarity of the country, he mixed high with low, the classicism of workwear with more casual pieces, By Appointment looks (the brand’s made-to-order wing) to mass-produced ready-to-wear. 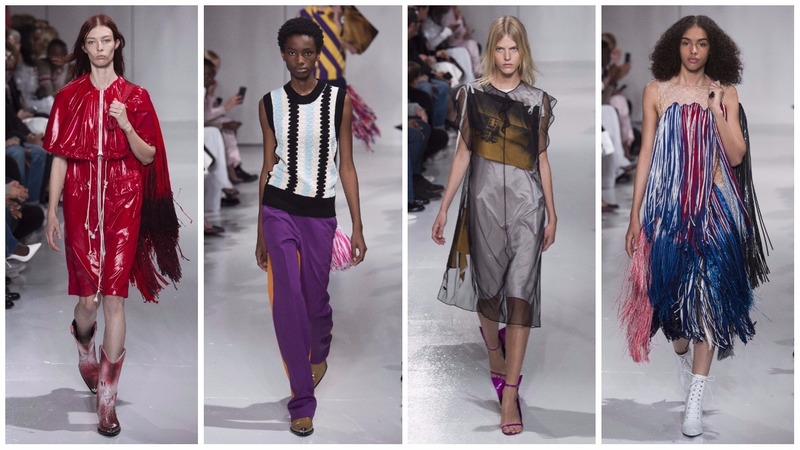 This season’s cornerstones were Warhol, Carrie and The Shining, his friend and artist Sterling Ruby, cheerleaders. He structured this with reference to Warhol’s screen printing, his colouration. 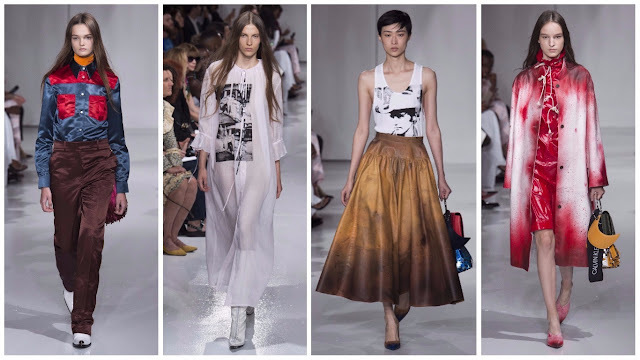 Prints from the late artist, made available by his estate, were asymmetrically applied to the nightgowns, which informed the Carrie inspiration, t-shirts and jeans. Ruby’s graffiti work was used on Western-inspired outfit, 50s-inspired skirts, well-tailored leather coats—one of them resembled blood splattering, perhaps poured from the Sterling Ruby buckets installed overhead. It segued into another American theme: cheerleading. There were red PVC tops and A-line skirts and they carried pompom-inspired handbags. Some of the fringe looks that closed the show resembled pompoms also. Simply, there was an overriding sense of horror. It’s easy to contextualise the notion of horror in America at present. With domestic terrorism and threats to people’s freedom, for Simons to display something informed by sinister, macabre reference points is timely. The way he does is it is inspired; he takes the classic tropes—the prom dress, the cheerleader, the cowboy, whatever it may be—and rethinks it in a way that is subsumed under broader understandings of horror, terror, fear. The ‘blood-stained’ coats, a figurative expression of the blood on our hands, if the country doesn’t galvanise against the Trump administration. Last season, ‘This is Not America’ by David Bowie intoned a message of the changing face of America. Frankly, this is America. This is a melange of cultural topics, rendered artistically by two outsiders, two immigrants. If it points to anything, the dissonant convergence of themes conveys America to be divided yet diverse. It is a metaphor for the fashion industry too: divided yet diverse.